Earlier this year, the Black Minds Project, an initiative of the Community College Equity Assessment Lab (CCEAL) at San Diego State University (SDSU) and the Black Male Institute at the University of California, Los-Angeles (UCLA) analyzed publicly available statewide data on school suspensions. The findings were summarized in a report titled “Get Out! Black Male Suspensions in California Public Schools.The study focused on exclusionary discipline—the practice of suspending or expelling students as punishment. Looking at this disparity from another perspective, the statewide suspension rate for Black males is 3.6 times greater than it is for all other ethnic groups. As an example, although only 3.6 percent of all students were suspended during the 2016-2017 school year, the suspension rate for Black males was 12.8 percent. The highest suspension disparity by grade level happened in kindergarten through third grade. In this regard, Black boys are 5.6 times more likely to be suspended than the statewide average. 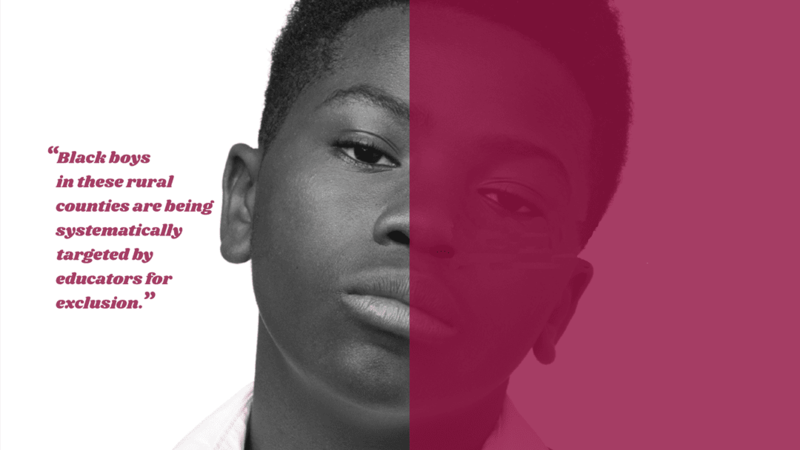 For Black males in foster care the numbers are startling. Results show they were suspended at a rate of 27.4 percent. In addition, those in grades seven and eight had the highest overall suspension rate of 41.0 percent. The highest number of total suspensions occurred in large urban counties, including Contra Costa, Los Angeles, Riverside, Sacramento and San Bernardino. These five counties combined accounted for 61 percent of all Black male suspensions. Other counties with high suspension rates included Amador, Colusa, Del Norte, Tehama and San Joaquin. San Joaquin County displayed especially high suspension patterns. According to the report, in the past 5 years the county has reported suspension rates of 20 percent or above. Other counties in the state with similar patterns include Butte, Merced, Modoc, and Yuba. Several school districts in the state had large numbers of Black male students who were suspended at least once. They included Sacramento City Unified (887), Los Angeles Unified (849), Elk Grove Unified (745), Fresno Unified (729) and Oakland Unified (711). In at least ten school districts statewide, the suspension rate was above 30 percent. The report also included some good news. Since the 2011-2012 school year, suspension rates of Black males in California has declined from 17.8 percent to 12.8 percent. Also, 88 school districts in the state of varying size, urbanicity, and region in 2016-2017, had Black male suspension rates below the state average. Researchers report students who are exposed to suspensions were found to be at greater risk of dropping out of school. They concluded students who are suspended or expelled are significantly less likely to attend a college or university. This is problematic because career prospects of those without a college degree are severely limited as a bachelor’s degree is now viewed as the entry-level requirement for many jobs in today’s workforce. Suspensions and expulsions have also proven to be a pathway into the criminal justice system—feeding the school to prison pipeline. There is a need to ensure that intensive, on-going professional development is provided to all educators (e.g., staff, teachers, administrators, counselors) on topics such as unconscious bias, racial microaggressions, culturally mediated behaviors, and teaching practices for male students of color. It is essential that schools and school districts work to eliminate the suspension of young children as it can foster antipathy towards school environments and impact students’ perceived sense of belonging in learning environments, confidence in their academic abilities, and perceptions of the value of school. Understanding the variation in suspension rates across the state can provide key insights and questions that can encourage dialogue and changes in the excessive use of exclusionary discipline across the state. Every school district should establish a framework for reducing the suspension of all students, with targeted efforts for groups who experience high suspension disparities. Each district should examine their behavior guidance policies to determine the extent that they align with evidence based and high impact practices identified by Garrity Longstreth, Salcedo-Potter and Staub (2015). The state should establish an exclusionary discipline taskforce within the California Department of Education charged with supporting counties and districts in their efforts to reduce exclusionary discipline. Schools should adopt a practice that requires that foster youth not be suspended unless an advocate is present. Each school district should establish a reporting system where students can confidentially report educators who engage in excessive use of disciplinary practices such as suspension. Districts should help personnel understand trauma, identify it when students misbehave and provide teachers with strategies and skills to diffuse situations, redirect behavior, and empathize with students who may be in pain or distress. There is a general cultural disconnect that occurs between many teachers and Black students—particularly Black male students. This includes culture influences cognition, thinking, speaking, behavior, and learning. Many Black boys frequently find themselves in classrooms with teachers who have limited to no understanding of their cultural ways of knowing and being. The full report, Get Out! Black Male Suspensions in California Public Schools is available here. Note: Although this report focused solely on Black male students, the report’s publishers acknowledged Black female students experience similar disciplinary practices.